Thanks for all the moments we have shared in 2014! We are humbled by the kindness of our loyal students and community partners. In 2015, we anticipate more memorable times with the upcoming focus on our artistic endeavors and children’s programs… with more exciting things in the works! In January, we begin our fitness line up with a new rotation of options bringing back the ever fun BOLLYWOOD on Thursday evenings with our super friendly instructor Kat Gulledge. Virginia Vecchione will head up most of the classes as our Head Instructor guaranteeing a great way to have a blast during your workout and encouraging you to work happily towards your goals. Sierra Hauser will unveil more of her talents by instructing ArtInspired’s Paint Nights starting the end of January. 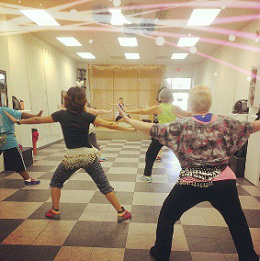 She is also adding to our line up the groovy RETRO DANCEFIT on Wednesdays. Instructors Fee Fee Tolbert, Lorna Thielen and Colleen Hall will be treating you to their talents this month and Nhelly Hughes will be working along side to help launch some KID FITNESS classes in February. As for me, I will be teaching YOGALATES, PILATES and YOGA during the mornings as I progress in my twin pregnancy. You may see me on some evenings helping with admin activities. There are tons of wonderful things around the corner! I am very pleased to be a part of it 🙂 Feel free to contact us if you need assistance with any of our programs. ArtInspired offers programs in wellness / fitness, art, photography, marketing services and more. We are based in Yorktown and Newport News, VA in the heart of Hampton Roads. Previous Post New Look to our Website!